Dr. Guthrie has been a chiropractor for 20 years. 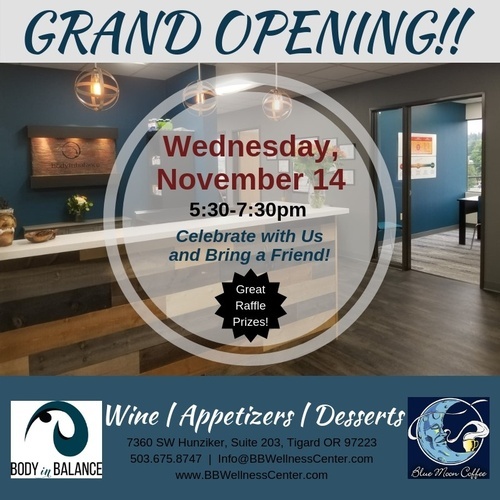 Join us and the Lake Oswego Chamber of Commerce to celebrate the grand opening and ribbon cutting of their new location! There are many people who have made this practice possible, and we look forward to celebrating them and Dr. Guthrie's accomplishments. Open to all, bring friends and family. Enjoy delicious wine, appetizers, and desserts from Blue Moon Coffee. You do not want to miss this event. There will be raffle prizes, and the more guests you bring the more tickets you get!